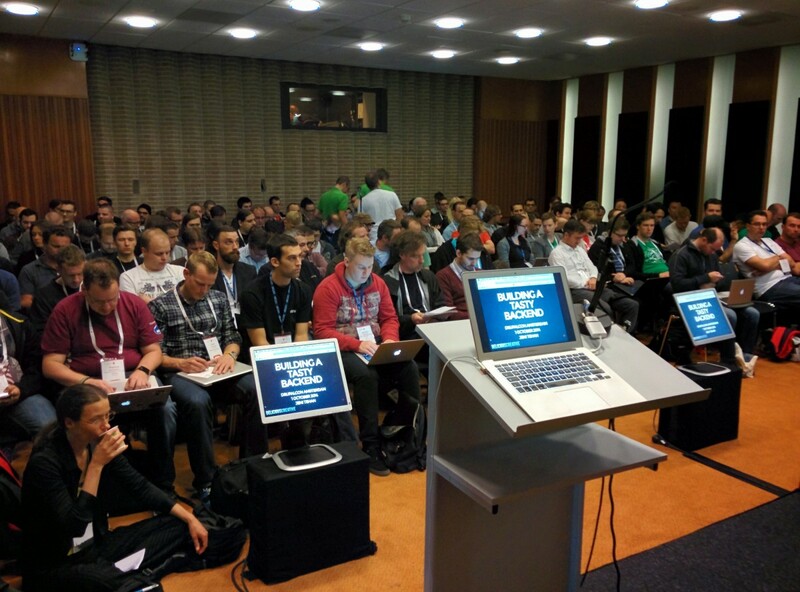 Last week was DrupalCon Amsterdam 2014 and what a week it was! This was my fourth DrupalCon after going to Prague, Munich, and London before, and as usual it did not disappoint. DrupalCons are always a bit mind blowing in that you experience so much over the course of just a few days. Through the sessions, BOFs, and the hallway track, you're constantly learning and hearing about the great things happening throughout the Drupal community. It's incredibly inspiring and after DrupalCon I always want to rush back and start testing out all the cool things I saw or talked about. Sadly in the real world there's just not enough time in the day, but hopefully the inspiration will linger on throughout the autumn and winter. One week ago today was also the day when I presented my Building a Tasty Backend session at DrupalCon. I've been doing the Tasty Backend session for about 2.5 years, first in Brighton in April of 2012. And since then I've been fortunate to be able to speak at just about every DrupalCamp in the UK, and even a few in Pakistan via Skype. Starting out speaking at Drupal events the thought of one day being able to speak at a DrupalCon wasn't something I really considered would ever happen. I was quite happy, and quite nervous, to be speaking at camps and user groups. But over time some of the camps got a lot bigger, and as I refined the session, in addition to how I was actually building the Tasty Backend itself, I became more used to doing the talk and more confident that it was an important topic to be addressed. But I still never really thought I'd get into DrupalCon, that just seemed to be another level! When session submissions came around this year I thought I'd give it one last chance. I had submitted the session for DrupalCon Prague the year before and wasn't picked, but I figured if the session were to ever get picked for a DrupalCon, the one in the city of Amsterdam would be a good candidate! When I got the email that I was selected I jumped in the air and paced around my flat almost endlessly that night, so thrilled that I got into the big one. It really was a dream come true. So why did it mean so much to me? I started freelancing about six years ago after being made redundant at the job that brought me to the UK. The first few years were tough, just scraping by and working almost endlessly. Over time I learned an incredible amount about Drupal, and starting piecing together the Tasty Backend. But it was getting involved in the Drupal community that really did it for me. The community gave me support and an ear to listen that understood what I was talking about since my friends were sick of me talking to them about Drupal. The community helped me learn, the community gave me the tools to be successful, the community helped me become the developer that I am today. Without the Drupal community my life wouldn't be the same at all. I'm honoured to be a part of it and happy to be able to give back through talks, code, or just helping someone out in IRC. To go from a struggling freelancer who doesn't think she knows what she's doing, to a speaker at a DrupalCon has been amazing, and I can't thank the Drupal community enough. Thanks for presenting at Drupalcon Amsterdam. I really enjoyed your session. I have been to a few presentation about improving the backend over the last few Drupalcons. I always try to glean as much as I can from these sessions. I am working on an installation profile for my organization and hope to incorporate as much of the Tasty backend as I can into that. It looks like the sandbox on drupal.org is from awhile ago and that your most recent work is on github. The sandbox looks like it was a feature while github has a installation profile and several feature modules. Hi Frederick, thanks for the feedback! I'm glad you're spending the time to get your backends optimised for your admins. Yeah, the sandbox on drupal.org is quite old and was created directly after first doing the session in April 2012. Everything that I'm currently working on is up on Github, so using those modules versus that sandbox feature is highly recommended. Just check out my repos for all of the Tasty Backend modules. I'll be moving everything from Github over to Drupal.org shortly, though, so watch out there for a full release of the Tasty Backend installation profile as well as full releases of all the modules. Leave this field blank if you're a real person.